Posted 10/17/2014 10:34am by Cheryl Ferguson. What a gorgeous morning! Beautiful sunshine, pleasantly cool -- the perfect fall day. Hard to believe we had such turbulence earlier in the week. Tuesday evening we were securing anything that might blow due to forecasts for tornadoes and high winds -- thank goodness those didn't come but we did get nearly 2 inches of rain. It's nice to have a sunny, calm day. Our week has been a hodgepodge of clearing, planting, fertilizing and harvesting. The strawberries are now in the ground (fortified by a nice sip of fish emulsion as a toddy to get them through the winter). Kale, bunching onions and leeks have also been planted -- but there are a lot more greens to come! And more potatoes! As many of you know, we have been without a pet cow for 3 years. Yam, our beloved bovine, was a fixture in the pasture and the official greeter for the Capella Community. We have been looking for her successor somewhat half-heartedly because we don't really have the time for another bottle baby calf. But we got a call on Saturday evening from our vet telling us about a calf. On Sunday, we went up to the Sparks Family Farm just outside Stuart and picked up the tiniest, cutest Angus. Cheryl decided his name should be "Sparky." His prognosis wasn't very good -- had been born on Thursday and his mother wasn't really producing milk. And the weather had been very wet and cold. But we loaded this limp little guy into a large crate and headed back to the farm. My cousin had space in his barn and we fixed up a warm, cozy spot. He eagerly took his first bottle of milk and started showing more energy. When we checked on him later in the night, he was sleeping peacefully. The next morning when we went over to feed him, unfortunately he had not made it. It was very hard to lose him so soon, but Sparky opened up space in our hearts and heads for another calf -- it won't be another 3 years before there is a friendly bovine in the pasture. On Saturday, we'll be at Cobblestone Farmers Market at Old Salem (9-12). This Saturday is the Harvest Day: Pigs and Pippins in Old Salem so it may be extra busy. On Wednesday, find us at the King Farmers Market at the Stokes Family YMCA (11-1). On our tables you'll find lots of garlic! Garlic Powder and Garlic Granules (Spanish Roja & Music), bags of Seed Garlic for planting, Culinary garlic -- Elephant, Music, Inchelium Red, Chesnok, German Red, and Lorz Italian -- and garlic braids. Those yummy LaRatte Fingerling potatoes will be there in bunches! Lots of okra (burgundy and green). The tomatoes are still on the menu but in much smaller quantity! There will be Aji Dulce (the sweet habanero) and shishito peppers, as well as swiss chard and eggplant (small amounts) -- all Certified Organic! We also have a new batch of Basil Pesto! In the Jam Department, we are all stocked up! As a reminder, if there is anything that you would like for us to hold for you at market just let us know by e-mail, by the evening before, and we will be glad to put it aside for you. Here's wishing you a wonderful Sweetest Day tomorrow. It's a day for you to recognize a sweet and special someone. It doesn’t matter who that person is, or what their relation is to you. They just have to be "sweet" in order to get a little recognition. Posted 10/10/2014 12:02pm by Cheryl Ferguson. On Saturday, we'll be at Cobblestone Farmers Market at Old Salem (9-12). On Wednesday, find us at the King Farmers Market at the Stokes Family YMCA (11-1). What will you find on our tables? Garlic in all forms! Last week we had the first batch of our beautiful garlic braids available -- there will be more this week! Wouldn't one of these decorative and functional braids look great in your kitchen? And they make great gifts too -- special orders are available! There are 10 bulbs of delicious Nootka Rose garlic in each braid. Nootka Rose is Cheryl's favorite roaster and they are VERY long-lasting. We'll also have the first of our varietal Garlic Powder and Garlic Granules (Spanish Roja & Music) and bags of Music Seed Garlic for planting. Culinary garlic will be on the table as well -- Elephant, Music, Inchelium Red, Chesnok, Purple Italian (Last Week! ), and Lorz Italian. The tomatoes are still on the menu but in much smaller quantity! We'll also have those delicious Striped Romans, heirloom slicers, saladette tomatoes, and pints of Red Pearl grape tomatoes. Just a few more snap green beans (Rattlesnake Pole)! There will be Aji Dulce (the sweet habanero) and shishito peppers, and okra (green & burgundy), and those yummy LaRatte fingerling potatoes -- all Certified Organic! In the Jam Department, we are all stocked up! And since so many of you like to see our crazy cats -- here's another picture. I like to call this "Ajo Squared." Posted 10/3/2014 8:52am by Cheryl Ferguson. As it dawns on us that there are less than 3 months left to the calendar year, we are rushing to get many things done before the first frost!! Things are starting to change in the fields as we transition from summer to fall/winter crops. One of the biggest changes is that most of the tomato plants have been taken down and the t-posts and trellis lines have been removed -- the field looks so much different now! As part of our field sanitation and insect /disease control, we burn much of the residue from the field. This helps make sure that bad bugs don't have a cozy home to hang out over the winter. We move the cuttings to a burn pile away from other fields and structures and light it. Since the residue on the pile was dry, the pile burned quite quickly. Lots of other things going on -- we were contacted by TWC News (formerly News 14 Carolina) for an interview on the availability of funding for organic certification. So yesterday, Cheryl showed the reporter around the farm (in the fog) and did a brief on-camera interview -- hopefully no equipment was broken in that event! Next Tuesday (10/7), Cheryl & Ray will be doing a workshop on "Growing Great Garlic at Home" at Reynolda Gardens. It will be from 7-8 p.m. in the Education Wing. There is a $5 fee unless you are a Friend of the Gardens or are Wake Forest University faculty, staff or student. Come on out and learn about growing garlic at home! On Saturday, we'll be at Cobblestone Farmers Market at Old Salem (9-12). On Wednesday, find us at the King Farmers Market at the Stokes Family YMCA (11-1). What will you find on our tables? Old Salem market customers -- this will be the last week for our roaster and Sweet Italian Roasting Peppers. Just follow your nose to our purple tent! Samples too! And tomatoes are still on the menu! Our feature this week is the Mini Orange tomato. A great salad size tomato! We'll also have those delicious Striped Romans, heirloom slicers, quart boxes of tasty saladette tomatoes, and pints of Red Pearl and mixed fruit tomatoes. Just a few more snap green beans (Rattlesnake Pole)! The first of the Garlic Braids will appear! As usual, there will be lots of garlic -- Elephant, Music, Inchelium Red, Chesnok, Purple Italian, and Lorz Italian -- as well as Aji Dulce (the sweet habanero) and shishito peppers, swiss chard (small amount) and okra (green & burgundy) -- all Certified Organic! And if you want to try the Garlic Scape Pesto -- this will be the last week (until next year)! In the Jam Department, we are all stocked up! And don't forget our certified organic strawberry plants. Chandler and Sweet Charlie are available in 4-packs -- this will be the last week. Posted 9/26/2014 3:58pm by Cheryl Ferguson. The Equinox is behind us and we are now steadily moving into Fall. And what a bracing start it's been! We have been scrambling to dig out the sweatshirts and jackets as the morning temps have hovered in the mid-50s (and never crawled much beyond 65 several days!). But I am sure we will have more balmy, sunny days ahead -- those beautiful days of Indian Summer! It is interesting to notice how things change though during the course of a year if you pay attention. Earlier in the summer, the morning air was filled with a chorus of bird songs -- an entire symphony of bird music from sparrows, cardinals, finches, mockingbirds and more. It is much quieter now. As the birds ready themselves for migration and winter, I suppose they have less time for song. We've also been busying ourselves with winter prep as we work on raised beds for kale, lettuce, onions and chard. Here are some photos showing the rolling out of the plastic for the beds, covering the edges of the fabric with the Cub and the final shot -- these nice beds in Daddy's Garden are all ready for planting! Today was a special day at the farm. We were asked by Rabbi Mark Strauss-Cohn of Temple Emanuel to host the congregation's second day of Rosh Hashanah. This is the Year of Shmita/Release and Sabbatical and they wanted to spend some time on a farm to learn how we care for the earth and the importance of letting the land heal. We had a wonderful ceremony at the lower pond and we finished the day picking muscadine grapes and planting radishes. Thank you so much for your visit, Temple Emanuel! Happy New Year! On Saturday, we'll be at Cobblestone Farmers Market at Old Salem (9-12). On Wednesday, find us at the King Farmers Market at the Stokes Family YMCA (11-1). What will you find on our tables? Old Salem market customers -- we'll be back with our roaster and Sweet Italian Roasting Peppers and we will roast them for you on-site for FREE! Just follow your nose to our purple tent! Samples too! Yes! We still have tomatoes! The 500+ pound harvests are a memory but we will have LOTS of 'em at market! We'll be bringing back the heirloom Valencia tomato as our feature this week. A beautiful tomato with a great taste! We'll also have those delicious Striped Romans, heirloom slicers, quart boxes of tasty saladette tomatoes, and pints of Red Pearl and mixed fruit tomatoes. We were able to get a few more snap green beans (Rattlesnake Pole)! As usual, there will be lots of garlic -- Elephant, Music, Inchelium Red, Chesnok, Spanish Roja (last week! ), and Lorz Italian -- as well as Aji Dulce (the sweet habanero) and shishito peppers, and okra (green & burgundy), -- all Certified Organic! And better hurry to get your Garlic Scape Pesto -- this will likely be the last week! In the Jam Department, we are all stocked up! And don't forget our certified organic strawberry plants. Chandler and Sweet Charlie are available in 4-packs -- fall is strawberry planting time! Saturday is Johnny Appleseed Day. The day honors one of America's great legends -- a real person born on September 26, 1774. John Chapman was captivated by the movement west and as traveled, he planted apple trees along the way, and sold trees to settlers. With every apple tree that was planted, the legend grew. Posted 9/19/2014 10:03am by Cheryl Ferguson. Yes, it's National Talk Like a Pirate Day and we jes' couldn't help but getting in on the fun. Avast! This morning we are quite confused (pirates can be, you know!). Weather.com and Accu-Weather both say that it is not raining....but it is pouring. I've heard of heavy fog, but this is ridiculous! Arrr! We took advantage of a cool, moist morning yesterday to spend time in the potatoes to get them thoroughly weeded and cultivated. Wow, they are looking good! This coming week we'll start planting more of our fall crops (onions, kale, swiss chard, lettuce, beets and more) and get the beds shaped and covered for strawberries. Ray spread leaves this week for the new strawberry field. Those little plants will be tucked in the ground in soon! On Saturday, we'll be at Cobblestone Farmers Market at Old Salem (9-12). On Wednesday, find us at the King Farmers Market at the Stokes Family YMCA (11-1). What will you find on our tables? Old Salem market customers can look forward to sampling freshly roasted peppers this week! Our sweet Italian Roasting Peppers will be available and we will roast them for you on-site for FREE! The delicious aroma will waft throughout the market -- so just follow your nose to our purple tent! 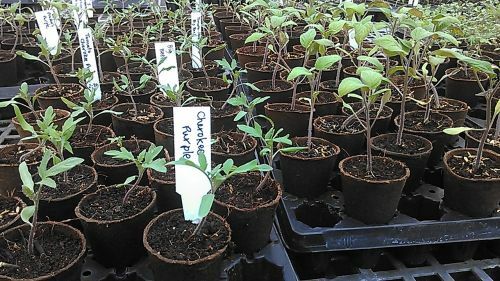 Even though many of our colleagues have pulled out their tomato plants, we still have LOTS of 'em! We'll be featuring the beautiful and fruity Blush tomato. This was the 3rd place tie in the Winston-Salem Journal Tomato Tasting this summer and is a real treat. Come have a taste of one of our new favorites! We'll also have those delicious Striped Roman and Valencias, heirloom slicers, quart boxes of tasty saladette tomatoes, and pints of Red Pearl and Suzanne. This will be the last week for snap green beans (Jade & Rattlesnake Pole) and French filet-type beans (Coban & Tavera). There will be as usual lots of garlic -- Elephant, Music, Inchelium Red, Chesnok, Spanish Roja (last week! ), and Lorz Italian -- as well as Aji Dulce (the sweet habanero) and shishito peppers, okra (green & burgundy), and garlic chives (small amount) -- all Certified Organic! Our delicious Garlic Scape Pesto was a hit last week and it will be back. In the Jam Department, we are all stocked up! Aye, aye! Enjoy the Autumn Equinox at 10:29 p.m. on Monday! Posted 9/12/2014 1:42pm by Cheryl Ferguson. And speaking of peppers, our Old Salem market customers can look forward to sampling freshly roasted peppers NEXT week at market! It's strawberry planting time! We picked up our order of 2,000 strawberry plants at Cottle's Strawberry Nursery in Faison on Tuesday and they are resting comfortably in the greenhouse while we get the field ready for them. We will have our certified organic strawberry plants at market this week that we grew from tips from our own plants. Chandler and Sweet Charlie are available in 4-packs -- fall is planting time! On Saturday, we'll be at Cobblestone Farmers Market at Old Salem (9-12). On Wednesday, find us at the King Farmers Market at the Stokes Family YMCA (11-1). What will you find on our tables? Tomatoes will still be there in force! We'll be featuring the unusual and beautiful (and tasty!!) Striped Roman tomato. Come have a taste of one of our favorites -- it does double duty as a sauce tomato and it works in sandwiches too! We'll also have heirloom slicers, quart boxes of tasty saladette tomatoes, "fruit" boxes, pints of Red Pearl and Suzanne and the beautiful "Blush" tomato. Plus we'll have snap green beans (Jade & Rattlesnake Pole) and French filet-type beans (Coban & Tavera), lots of garlic (Elephant, Music, Inchelium Red, Chesnok, Spanish Roja, and Lorz Italian), Aji Dulce peppers (the sweet habanero), okra (green & burgundy), and swiss chard (small amount) -- all Certified Organic! New this week is our delicious Garlic Scape Pesto and we'll have our regular basil pesto as well. In the Jam Department, we are rebuilding our supply and have the Raspberry-Chipotle Chile Jam and Raspberry-Chipotle Mole Sauce back in stock! Posted 9/5/2014 11:39am by Cheryl Ferguson. 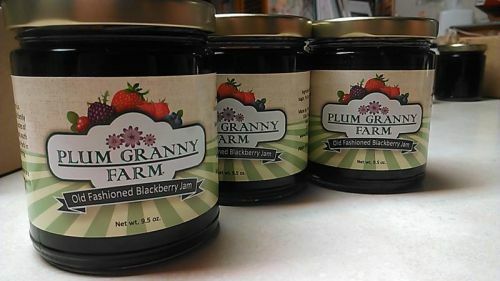 Just a reminder that you're receiving this email because you have expressed an interest in Plum Granny Farm -- you either signed up at a market or on our website. We are glad to have this brief opportunity to share some news of the farm with you! If you no longer wish to receive these weekly newsletters, please see the "unsubscribe" information at the bottom of this email. As we settle into September, the fact that we have only four more months left in the year really hits us hard. In the rush to get things out of the field, we've got to be getting things in the fields as well. Ah, the constant pursuit of the illusive dream of balance. Lots of things coming out the fields -- and thanks to several of you, tomatoes were among them! Our second Tomato Pick Your Own was a great success with nearly 300 pounds of tomatoes finding new homes in kitchens across the Triad! Thanks so much for coming out on a warm Labor Day for picking! What's been happening this week on the farm? Cultivating the new potatoes was an early task this week. Here's a shot of the field before they got cleaned up. And a correction -- I misspoke last week when I said we were out of fingerlings. I found a box of Red Thumb so look for them at tomorrow's market! On Saturday, we'll be at Cobblestone Farmers Market at Old Salem (9-12). On Wednesday, find us at the King Farmers Market at the Stokes Family YMCA (11-1). What will you find on our tables? Tomatoes will still be there in force! We'll be featuring the tasty Red Pearl grape tomato -- come have a taste of Cheryl's favorite! We'll also have heirloom slicers, quart boxes of tasty saladette tomatoes, "fruit" boxes, and the beautiful "Blush" tomato. Plus we'll have snap green beans (Jade & Rattlesnake Pole) and French filet-type beans (Coban & Tavera), lots of garlic (Elephant, Music, Inchelium Red, Chesnok, Spanish Roja, and Lorz Italian), Aji Dulce peppers (the sweet habanero), okra (green & burgundy), potatoes (German Butterball and Red Thumb fingerling), Potato Popcorn (tiny potatoes that are ready for roasting), French Red shallots, swiss chard (small amount) and pineapple tomatillos -- all Certified Organic! And we'll have our purple and regular basil pestos and yummy jams. And Old Fashioned Blackberry and Baby Ginger-Strawberry-Mint are back!! And take a moment to celebrate National Grandparents Day on Sunday. This special day was established by President Carter in 1978. Remember those special people who were always so happy to see you! Posted 8/29/2014 10:38am by Cheryl Ferguson. Labor Day -- wow. It is hard to comprehend that summer is over. Feels like the fastest year ever. This holiday is one where we celebrate laborers. We should think about how our country runs on the toil and sweat of workers. It is true that many jobs now are white-collar office jobs -- and those are important. But we need to remember how critical all of those manual labor jobs are -- they keep the wheels turning (literally and figuratively). We want to thank our employees that work along side of us to keep the farm weeded, planted, harvested and mowed. A tip of the hat to Jen, Chris and Elliot!! Thanks for all you do! What's been happening this week on the farm? We are starting seeds for fall crops. Boxes of seeds came in the mail last week (always exciting!) More kale and lettuce has been seeded and we have trays of plants that are ready to go in the ground. Here's some kale that is coming up already -- just planted on Tuesday! We are also planting another crop of basil in Raz House today -- here go the plants (and Detroit!) off to the hoop house. Maybe he is looking for the catnip plants? The last round of the summer potatoes was harvested on Tuesday. This is a new variety that we trialed -- "Papa Cacho," a Peruvian fingerling. We won't be bringing it to market this year; we just planted a little bit to see what it was like. A very interesting and large fingerling! And don't worry, we are still in major tomato mode around here! They keep on coming and are looking really nice! Our first Pick-Your-Own Tomato event was great so we are doing it again! Come on out to the farm on Monday, September 1 from 9-1. There are all kinds of tomatoes from cherry, grape, roma-type to big ol' slicers -- in a rainbow of colors! These yummy certified organic tomatoes are only 75 cents per pound. We'll also have our other farm products available for sale. The weather is a bit iffy for Monday, so call (336-994-2517) or check our website (www.plumgrannyfarm.com) to make sure it is still happening. On Saturday, we'll be at Cobblestone Farmers Market at Old Salem (9-12). On Wednesday, find us at the King Farmers Market at the Stokes Family YMCA (11-1). What will you find on our tables? Tomatoes! Three new tomato-related items: a Ratatouille Kit (tomatoes, eggplant, peppers, garlic, onions), 10 pound boxes of canning tomatoes (sauce-types), and quart boxes of tasty saladette tomatoes. We'll be featuring our lovely Valencia tomato -- come have a taste of this orange beauty! Plus we'll have snap green beans (Rattlesnake Pole), French filet-type beans (Coban & Tavera), and romano type beans (Pension and Dragon Tongue)! We'll also have lots of garlic (Music, Inchelium Red, Chesnok, Spanish Roja, and Lorz Italian), Shishito peppers, okra (green & burgundy), tomato fruit boxes, heirloom slicing tomatoes, potatoes (Nicola and German Butterball), French Red shallots, and pineapple tomatillos -- all Certified Organic! We'll have a new pesto this week -- Purple Basil! And we'll have our regular pesto and yummy jams. And did you know that today is More Herbs, Less Salt Day? Enjoy the delicious flavor of some fresh basil or mint today! Plum Granny Farm Weekly Update - Tomato Tsunami! Posted 8/22/2014 12:49pm by Cheryl Ferguson. Remember the Tomato Tornado I told you about last week? Well, the weather has changed -- it is now a full-fledged Tsunami! So many gorgeous and flavorful tomatoes! We have run out of storage in our milkhouse and have taken to using the only air-conditioned room in the farmhouse as additional storage. I hope most of you don't have to trip over tomato boxes and crates to get to your desk! The harvests have been huge. On Wednesday alone, we harvested about 380 pounds from 3 rows (plus about 250 pounds of culls for the compost). Our pick-your own was a success too with about 150 pounds finding new homes! What a profusion of tomato-y riches! We are not complaining. The abundance is really nice and it is giving us an opportunity to share with some local food pantries and we are stocking up on tomatoes in the freezer. Due to last summers rains, we only got a few tomato plants in the high tunnel very late in the season. It feels really good to have this amazing bounty and blessings this year. We hope you are enjoying it too! On Saturday, we'll be at Cobblestone Farmers Market at Old Salem (9-12). On Wednesday, find us at the King Farmers Market at the Stokes Family YMCA (11-1). What will you find on our tables? Tomatoes! Three new tomato-related items: a Tomato-Tomatillo Gazpacho Kit, 10 pound boxes of canning tomatoes (sauce-types), and quart boxes of tasty saladette tomatoes. Plus we'll have snap green beans (Rattlesnake Pole), French filet-type beans (Coban & Tavera), and romano type beans (Pension and Dragon Tongue)! We'll also have lots of garlic (Music, Red Toch, Chesnok, Purple Italian, and Lorz Italian), baby artichokes (few), Shishito peppers, okra (green & burgundy), tomato fruit boxes, heirloom slicing tomatoes, potatoes (LaRatte fingerlings and German Butterball), swiss chard, and beets (few) -- all Certified Organic! And don't forget our pesto and jams. Whew! Plum Granny Farm Weekly Update - Tomato Tornado! Posted 8/15/2014 1:36pm by Cheryl Ferguson. Wow! What a week it has been! Five days of rain followed by amazing, almost fall-like weather! It is SO good to see the sun again -- I really don't think I could make it in a very rainy, cloudy environment (one of the reasons Ray and I decided not to relocate to Seattle several years ago -- and chose Albuquerque!!) Nonetheless, the rain was most welcome and it should really kick things into gear. We just hope that it will be good plant development instead of disease....we'll just have to wait and see what happens. What's been happening this week on the farm? TOMATOES! Boy do we have a bumper crop! Our church in Albuquerque used to do an event each July called "Tomato Tornado" where we would try to get as many cans of tomatoes donated as possible for the local food bank. And we did a great job -- thousands of cans were collected and we had great fun with it (ask me some day about Beaudreaux and Thibideaux). Well anyway....Plum Granny Farm is having our own Tomato Tornado of a different kind! We've got LOTS of yummy tomatoes! And YOU can help us with that! Tomatoes in our storage room - the old milkhouse complete with air conditioner. We are having our first ever Tomato Pick Your Own event on Sunday, August 17 from 2-4 p.m. We'd like to share our bounty with you! We have all kind of tomatoes from cherry, grape, roma-type to big ol' slicers -- in a rainbow of colors! These yummy certified organic tomatoes are only 75 cents per pound. Come on out to the farm and have some fun! We'll also have our other farm products available for sale as well. Here's my grand-niece, Danielle, enjoying a tomato just her size! And in other tomato news, our "Suzanne" was named the Best Tasting Tomato at the King Farmers Market on Wednesday by both the celebrity judges and the votes of market goers! It is a beautiful red cherry tomato that is a tasty treat for sure! On Saturday, we'll be at Cobblestone Farmers Market at Old Salem (9-12). On Wednesday, we'll be at the King Farmers Market at the Stokes Family YMCA (11-1). What will you find on our tables? Tomatoes! Green Beans! 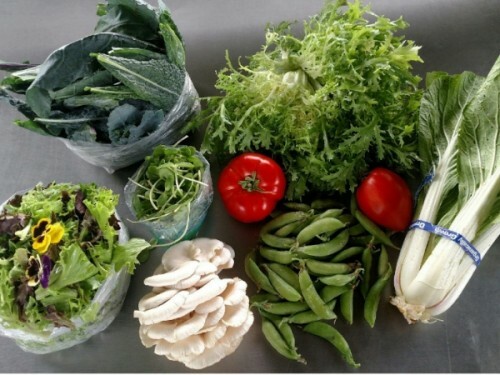 Yes, we'll have more snap green beans (Jade), French filet-type beans (Maxibel, Coban & Tavera), and romano type beans (Pension and Dragon Tongue)! We'll also have lots of Certified Organic Garlic (Music, Red Toch, Chesnok, Purple Italian, Lorz Italian and Metechi), baby artichokes, lots of Shishito peppers , lots of okra (green & burgundy), tomato fruit boxes, heirloom slicing tomatoes, Salsa Verde kits, potatoes (LaRatte fingerlings and German Butterball), swiss chard (little bit), pesto, jams and MORE!